Figure It Out! 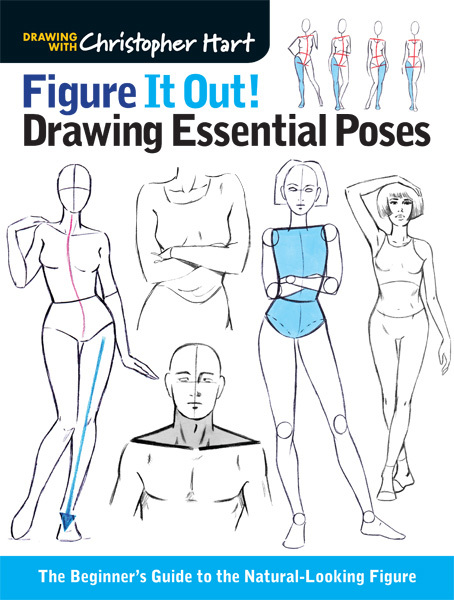 Drawing Essential Poses, the third book in bestselling author Christopher Hart's successful Figure It Out! series, shows artists how to overcome common challenges in drawing the human figure by transforming standard, stiff figure drawings with natural-looking poses for a more realistic effect. Starting with basic "Foundation Figures," Chris shows how to change an arm here or move a leg there to gradually achieve a more interesting, believable form. Through guided drawings highlighted with color to pinpoint key concepts, artists will learn how to easily create poses that are not only essential but also practical. Eschewing esoteric "art poses" that are often found in figure-drawing books, the focus here is on the gestures of real people from a variety of angles and positions such as standing, sitting, kneeling, reclining, arms folded, ankles crossed, hands on hips, and so much more. Deeper concepts such as perspective, illusion of depth, casting shadows, and foreshortening are also covered, along with step-by-step tutorials that will take artists through complete, naturally-posed figure drawings from start to finish. With a solid foundation in fundamentals combined with detailed instruction in more advanced techniques, artists of varied skill levels will have everything they need to master the art of drawing a realistic human form in any pose.